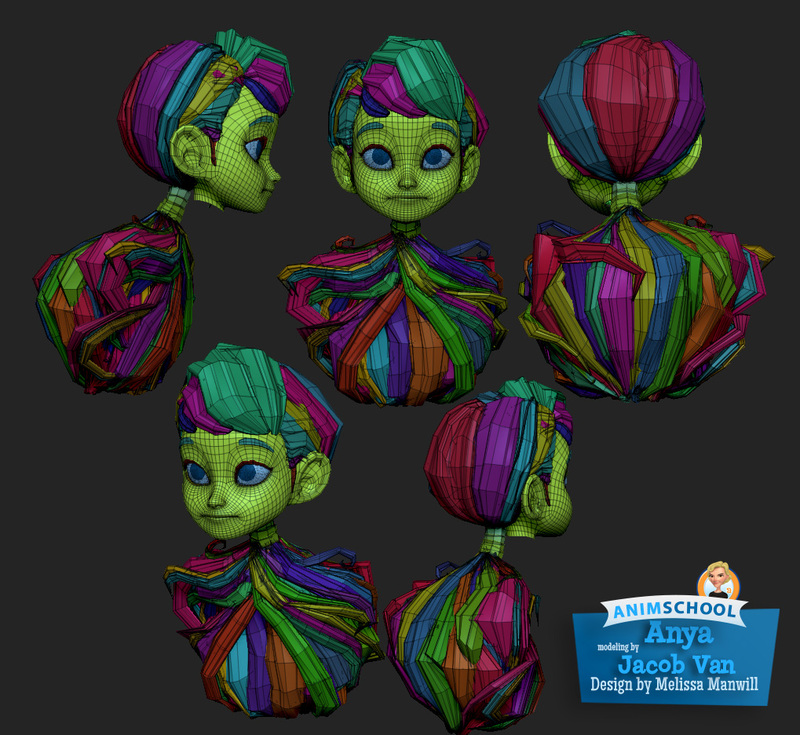 Today, we’d like you to meet Jacob Van who is a recent graduate from Animschool Modeling Program. He is one of the most helpful, hard-working, down to earth and friendly artists that we have in our community who doesn’t mind going extra mile to help fellow artists. 1: Hi Jacob. Tell us about yourself and your background. I am 33 years old. I live in Long Beach, California, USA. I have been married for 11 years and have four crazy kids. When I first got married my wife was putting me through school. I was going to community college and my plan was to transfer to Cal State University of San Jose for Traditional Animation. I was just about to transfer when my wife told me she was pregnant. So, I quit school with just an AA and went to work full time. I got a job repairing machinery. I kept drawing on the side. I eventually participated in a 5 second animation contest and it rekindled my passion for this field. 2: So how did your journey start in this medium? After doing the 2D animation contest, I started doing quick little animations. They weren't good, but I had a lot of fun. My friend told me to try 3D animation and he helped me getting started in that. I took some classes, but I think I lacked flavor. I wasn't happy with my results. Characters have such a strong pull on me. I moved onto modeling and started practicing Zbrush for a little bit. 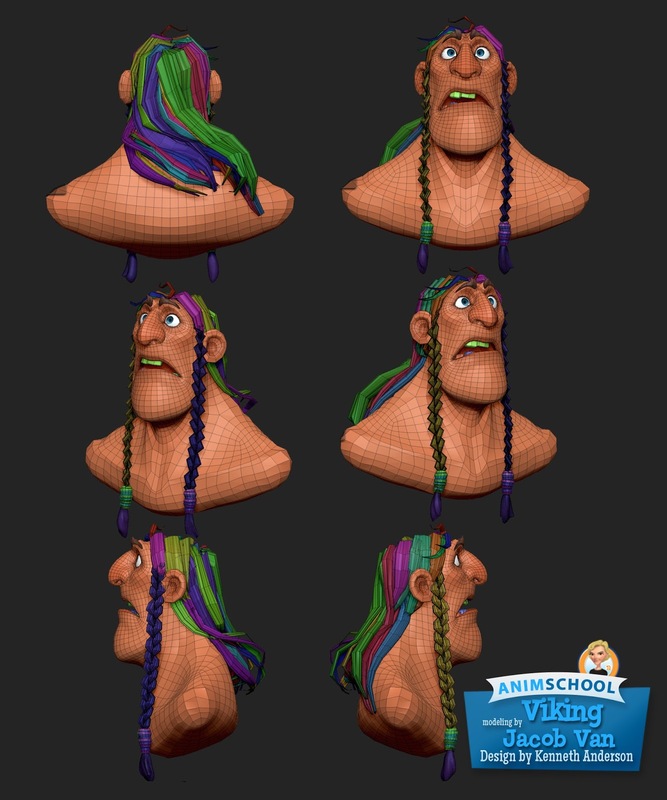 3: Why did you decide to join AnimSchool’s modeling program? After I had decided to learn how to model I started my search for online tutorials. There are a ton of tutorials out there for modeling a character or just objects in general. However, after following those tutorials, I quickly learned that everything was disjointed and I didn’t even know if the source of the tutorial was someone with experience in the industry or not. Sometimes, I would spend hours to find a credible working solution for some error I had encountered which made the whole process quite frustrating and time consuming. 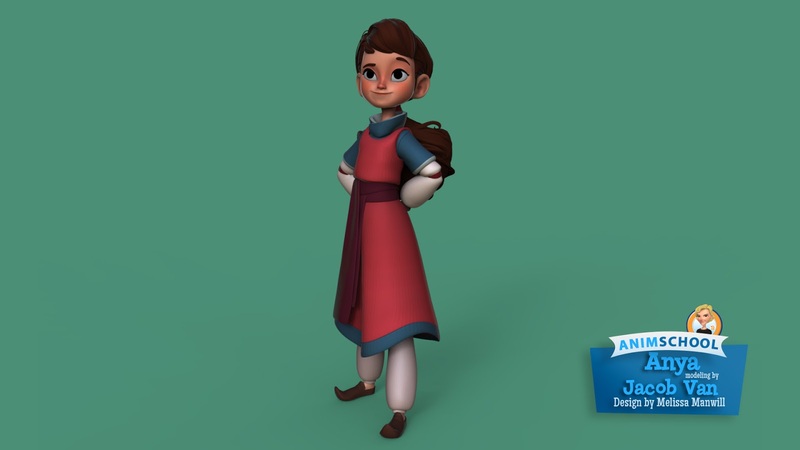 One day I was looking at other modelers work and I stumbled upon Eyad Hussein's website, a graduate of Animschool, I saw how appealing his work was and I decided that Animschool’s modeling program was worth looking into. 4: Tell us about your workflow and how did instructors help you shape it. My workflow between the intermediate modeling class and the advanced modeling class changed drastically. One of the main differences is that I started the model in Maya for the intermediate, and started the model in Zbrush for the advanced. The thought process is completely different in my mind. During the intermediate class I was constantly worried about topology and having things line up properly, I wasted a lot of time on that. In Zbrush I felt more free and focused on form first. You are always going to have topology changes along the way, so worrying about it is useless. At the end of my intermediate class, Brien Hindman really pushed me to take the Advanced Modeling course next. He said it would help my eye. I took his advice and had Dylan Ekren as my next instructor. Form and appeal are Dylan's strong points. He really tried to drive it home. He worked the whole body and head at the same time. Going from piece to piece to bring it to the next level. This process is the same as Animation-big to normal. Block things in and move on to the details. Get the blocking done really well and your details will go a lot smoother. I moved on to Juan Pablo Chen's Environment modeling class and this idea really helped. He really helped with organizing a scene with a lot of objects to prevent being overwhelmed. He is a solid modeller and a great teacher. He and Dylan put so much time into their classes. 5: Tell us about you models. The models I choose to do are based off of designs that make me want to model them. Models take so many hours and so much energy that you really need to pick something that inspires you. All of the designs I have chosen inspire me. I have always been a big fan of Disney's art. So, when deciding on a design I try to find something that could fit in Disney's world. Then while I am modeling I constantly compare my work to Disney's art. 6: Modeling is considered to be a very intricate job where you have to focus on all the details and capture all the nuances of a character design. Has knowing animation helped you in this process? I actually thought knowing animation would help more, but it hasn't helped much with capturing the design. I think it benefits you more on the rigging and topology side. You know, trying to predict whether the shape can be held when deformed. 7: Are you currently doing a job in animation industry? I don't have a full time job in the industry. I currently work repairing machinery in the packaging industry. I am either in the office ordering parts and working on in house projects or out in customers’ warehouses to fix their machines. However, I just received a freelance job from Animschool. David requested a modern office setting for an animation. I had to model all of the pieces that would go in the scene and then place them around the animation sequence. It was a tight deadline, but really fun. I think it is really awesome that they feel that confident in their students, and graduates, that they would use them for work. 8: Modeling is also a very time consuming field for starters. 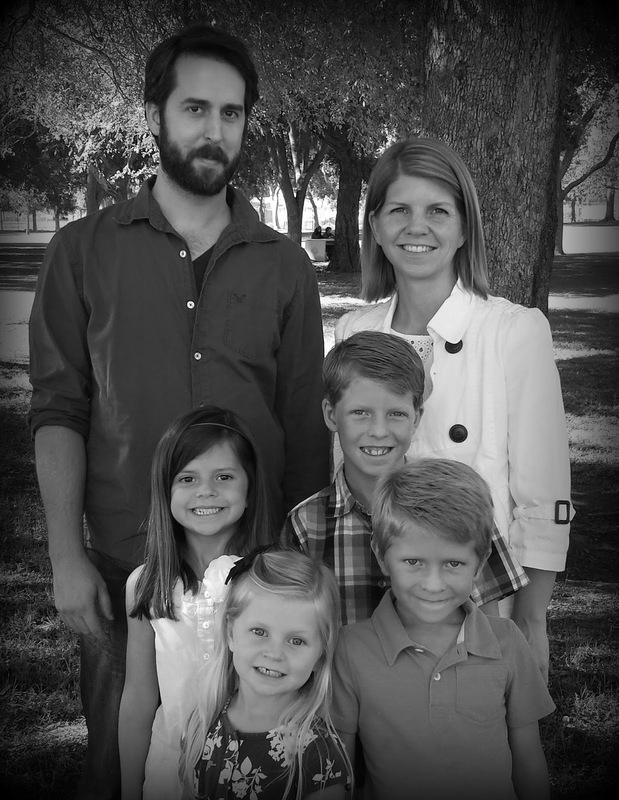 How did you manage balancing your daily job and this program while also taking care of your family? I have an excellent wife. Seriously, without her this would have been impossible. I spend most of my time at home trying to practice modeling or doing homework. A lot of times I feel guilty and ready to give up. But my wife would just say it's only a year and a half for this program, just get through it and then you will have more time. Whether you are responsible for just yourself, or a whole family, you will need some support. I don't think there is one artist, that I have talked to, that hasn't been depressed about their work at some point. At that point is when we need someone the most. After a while I decided that at least one day a week I wouldn't do modeling. I think I mostly stuck with that and that was the balance. To progress in anything requires sacrifice and learning modeling requires time. 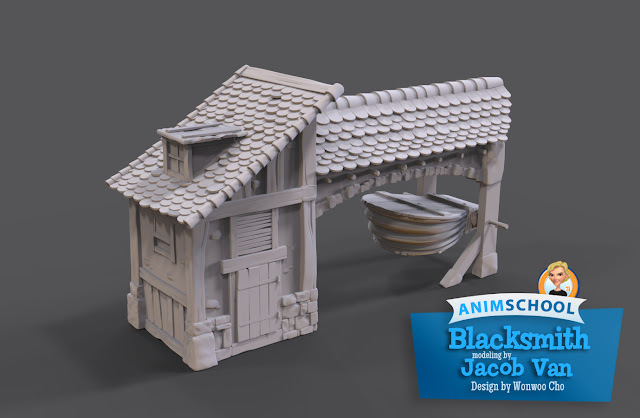 Without time you end up missing some of the polish and finalizing things on models. So, you have to be smart about your time and really rely on hot keys and your gut. One of the best things I can recommend is that people join their fellow students in a Google Hangout or some way of sharing the screen and motivate each other. Just having someone modeling on the other end of the computer helps you to do your work, even when you really do not want to. The good news is that the class does provide you with a lot of knowledge. Also, you can go back and watch the recordings and find a lot of things you missed the first time around. 9: What is the best advice you received in your training? The best advice is kind of funny. I heard multiple teachers say it. It is ugly until it is not, keep pushing it forward. Basically, everything is ugly at first and you have to work to bring the right forms and volumes through model. It is a really simple thought, but it helps to know that your instructors aren't satisfied with their work at the beginning too. Great job AnimSchool student Jacob VanValkenburg! Personal project between terms. 10: What is your advice for people who have a passion like you for arts but are doing job in other fields? My advice would have to be the same as the instructors. It is ugly until it is not. Life will be hectic, there will be a lot of stress and a lot of times you just want to give up. Keep pushing through, eventually you will have the skills to move into the field and that is a fun and exciting time. This is an investment of both time and money into your future. If it is worth something to you, then these teachers are the ones to help you through it. They are working in the industry and top names too. I mean Dylan modeled Hiro and Fred from Big Hero 6. Juan Pablo Chen modeled a ton of the environment in Kung Fu Panda 3. You can never go wrong learning from them. I am happy to be at the end of that particular journey, a little sad, but this is a new season to be excited for.